Check Out The Brothers BE! Not all of us have the good fortune to live on the West Coast (remind my why we’re in New York again?!) 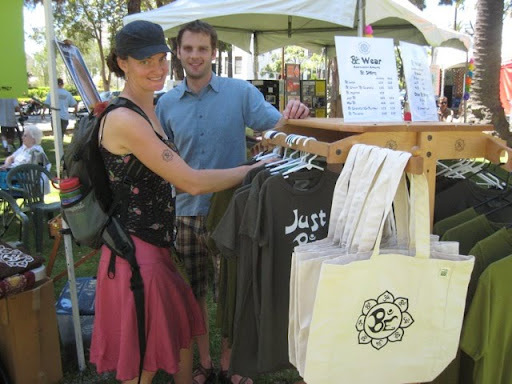 but if you were lucky enough to find yourself around Santa Barbara last weekend you may have happened upon their rockin’ Earth Day festival and if you were super lucky you saw some awesome stuff at the Brothers BE tent there. 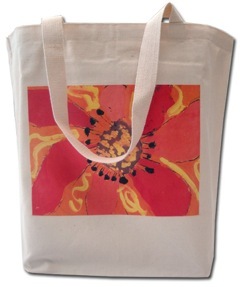 They offer shirts, Frisbees® and ECOBAGS printed with their own unique and striking designs. If you missed them last weekend, head over to San Luis Obispo to catch them at the county’s Earth Day celebration this Saturday! Or if you’re stuck on the wrong coast like us but want your own piece of the action, check out their online shop. You can also “Like” them on Facebook where they host awesome giveaways! If it weren’t for single use plastic bags, this man would not be 30 feet in the air on a forklift. 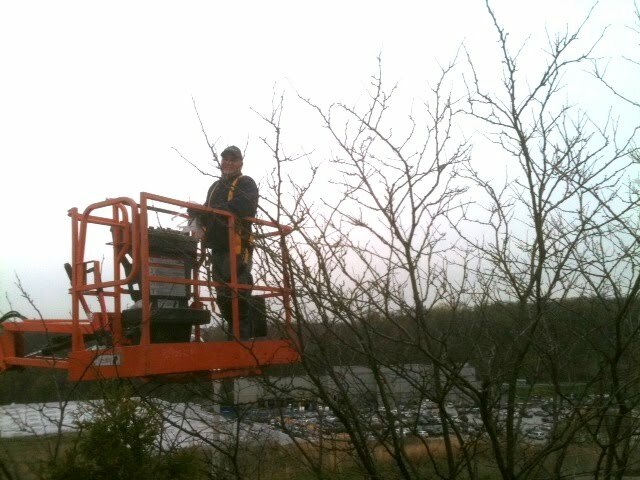 Part of his job is pulling flyaway plastic bags out of the trees in the Stu Leonard’s parking lot in White Plains. Do you have any “landmark” plastic bags? There’s one in my friend’s neighborhood that’s been there for two years. How about you? 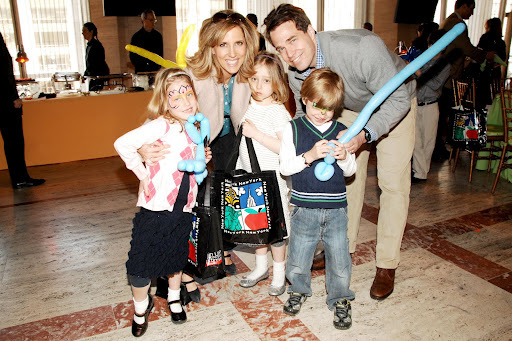 This past Saturday, New York City Opera hosted a fantastic, family-focused benefit to raise funds for their acclaimed education programs. The concert featured Oliver Knussen’s opera, “Where the Wild Things Are,” followed by a wild-themed party. Students from the Rush Philanthropic Arts Foundation created beautiful drawings inspired by the story that were projected behind the performance. Not only do nearly 5,000 kids benefit from the Opera’s education programs but the kids at the event received some pretty cool gifts too! 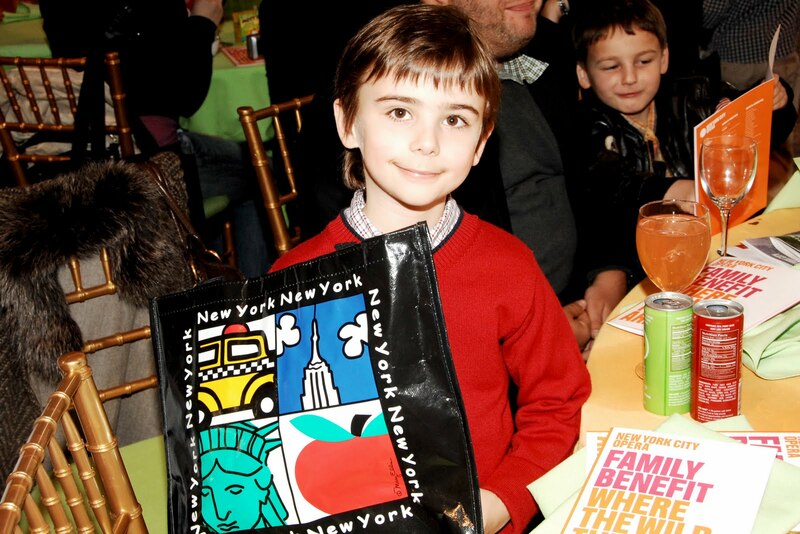 The ECOBAGS.com team donated our famous New York collage bags which were given out to all the children in attendance, filled with donations from Funky Monkey, New York Cruise Lines, HarperCollins Children’s Books, Lip Smacker, Izze, Magnetic Poetry, Ugly Dolls, and Deutsche Grammophon. The phone company delivered our new phone books two weeks ago. They dropped one at each house along my suburban town’s streets, wrapped in a bright orange single use plastic bag. We took ours in and placed it in the recycling bin. I don’t think the plastic bag can be recycled because it’s a heavier weight than the ones that my supermarket accepts. If you take a ride around our neighborhood there are dozens upon dozens of these phone books that are still at the curb in their bright orange bags. They’re a sign of times gone by for all who have instant Internet access. Why would I look through a phone book when a quick Internet search not only shows me what I’m looking for but offers addresses, product reviews and other data about that search? The phone book is only of use to those without access to technology. There’s a whole industry behind telephone books: sales agents, graphic designers, printers/binders. And then there’s the whole process of shipping them to their distribution points and finally bagging and delivering them to us. That’s one HUGE carbon footprint for something I don’t want or use, delivered to my home without me asking for it. Are phone books going the way of fax machines and rolls of film? What do you think? How could the phone company handle this better? Anyone with children, nieces, nephews, students or friends needs to know about SilverGraphics. They are a fantastic, women-owned (We hear ya, sister!) business that will print your own artwork on pretty much anything you can imagine. Back in 1995, Gretchen and Betty teamed up to combine their passions of art and sustainability to offer schools a useful, unique and effective fundraising option. They’ve since expanded into offering gorgeous and personalized gifts for your family and friends. 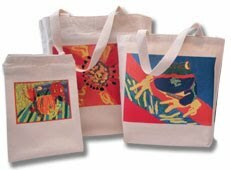 Can you imagine giving a mother custom grocery totes with her child’s artwork? You better have some tissues ready for that one, because there won’t be a dry eye in the house. 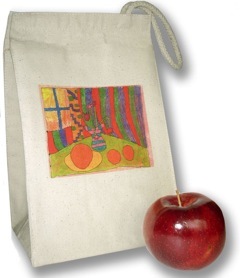 Or the pride a child would feel in taking a lunchbag with their own artwork printed on it? I’m pretty sure that’s how Picasso discovered his calling. We love companies that have a passion for protecting the environment like we do and we really think spreading that notion to children and families is the best route you can take. In addition to offering lots of planet-friendly options, SilverGraphics also donates $1 to The Conservation Fund for every order over $50. Check out their site at www.silvergraphics.com and make sure to get updates about the beautiful images they’re printing next by becoming a fan on Facebook!